Angelic purification brings a release from fear; the highest, purest colours and frequencies enter the upper chakras, opening the soul to greater understanding, to the dominion of angels; accepting the Divine love of the Universe. The photo on the left shows a cluster of galaxies – the fuzzy blobs – each of which contains billions of stars, as well as gas and dust, the components from which new stars are formed. 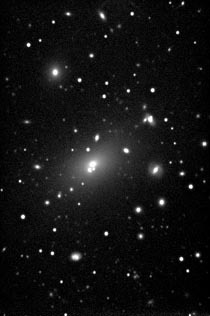 This is cluster Abell 2199. But this essence is channelled from the energy of the central galaxy – the large glowing expanse in the middle of the picture which can be seen to contain several bight centres, or cores. This is NGC6166, an enormous elliptical galaxy, which has grown to epic proportions through the merging of various individual galaxies. This is an essence of very rarefied energy indeed. First of all, it is highly purifying, working to totally release fear from one’s being. It has the energy of crystal clean air, and of rainbows refracting through snowflakes. “This NGC6166 galaxy allows the soul to accept and find closure for its current incarnation and look to move to a much higher spiritual level. If a soul is not ready to move onto a higher level of experience, either now or after this lifetime, the energy of the essence is not wasted. A form of communication goes on within the subtle body, where the soul can discuss how much the incarnated being can open to the angelic realm. “This essence calls in the highest possible frequencies of angelic love and understanding. Once inside you this never goes away. It is encapsulated into your patterning and its effects are felt forever.